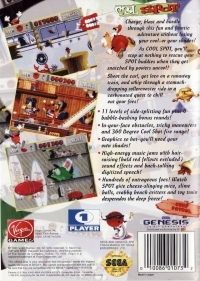 Description: 11 levels of side-splitting fun plus 6 bubble-bashing bonus rounds! In-your-face obstacles, tricky maneuvers and 360 degree Cool Shot fire range! 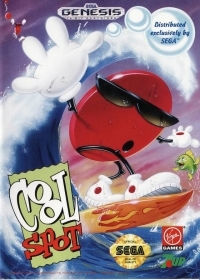 Box Text: Charge, blast and hurdle through this fun and frantic adventure without losing your cool - or your shades! As COOL SPOT, you'll stop at nothing to rescue your SPOT buddies when they get snatched by powers uncool! Shoot the curl, get loco on a runaway train, and whip through a stomach-dropping rollercoaster ride in a carbonated quest to chill out your foes! 08-26-2011 atariboy Description 11 levels of side-splitting fun plus 6 bubble-bashing bonus rounds! In-your-face obstacles, tricky maneuvers and 360 degree Cool Shot fire range! 08-26-2011 atariboy Box Text Charge, blast and hurdle through this fun and frantic adventure without losing your cool - or your shades! As COOL SPOT, you'll stop at nothing to rescue your SPOT buddies when they get snatched by powers uncool! Shoot the curl, get loco on a runaway train, and whip through a stomach-dropping rollercoaster ride in a carbonated quest to chill out your foes! This is a list of VGCollect users who have Cool Spot in their Collection. This is a list of VGCollect users who have Cool Spot in their Sell List. This is a list of VGCollect users who have Cool Spot in their Wish List.